Beignet Café...How Sweet It Is! So, you are craving some sweet, powdered sugar beignet goodness from New Orleans, but you don't happen to be in New Orleans, what do you do? Make your own? Well, you could, but if you are near Huntsville, AL, you could head to Beignet Cafe on Winchester Road. From Scottsboro, take a right on Sheilds Road (at the intersection with McDonalds and Arby's), and then another right on Winchester. Beignet Cafe is in Winchester Plaza on the Homer Nance side of the building. Do not use Google to find out Beignet Café's hours, at least for another couple of weeks. Google has it wrong and the owners were told it would be at least two weeks before the mistake is corrected. Go figure! We went over on Friday and Google said the restaurant was closed. I thought Friday was a peculiar day to be closed, so I kept looking. Their Facebook page told a different story. It said they were open, so I called to find out. Lo and behold, they were open and had just been made aware of Google's shenanigans. Anyway, we got directions and headed on over. I snapped a picture of the hours posted on their door, so you wouldn't have the problems we had. Open only since October 2015, the café is small, maybe a dozen tables. We were greeted, seated, given menus and had our drink orders taken within a matter of seconds. Our server was cute and friendly. When she brought out our drinks, she told us she was practicing making hearts in the foam of the café au lait. I just love initiative! We nibbled on a basket of beignets while we studied the menu. Breakfast and lunch items were both available. Oddly enough, though I am usually the lunch eater and Scott gravitates toward breakfast, we switched! He ordered the cranberry pecan chicken salad sandwich and loaded potato salad. It was as good as it sounds. The chicken salad was piled high on a split loaf of french bread. It was a big sandwich. We loved it and the potato salad, too. I couldn't resist the dirty grits with chicken and andouille sausage. And just to make sure I got enough carbs, I had a side of potato salad. Hey, don't judge! It was goooood! The grits were warm and spicy, but not too spicy. The potato salad was creamy and cool. 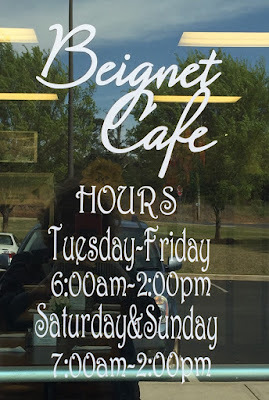 We will definitely be back to Beignet Café, especially now that we know their hours. Next time I want to try their shrimp po'boy...or their shrimp and grits...or the French toast! Oh, well! I think we will be back often! Maybe we will see you there! 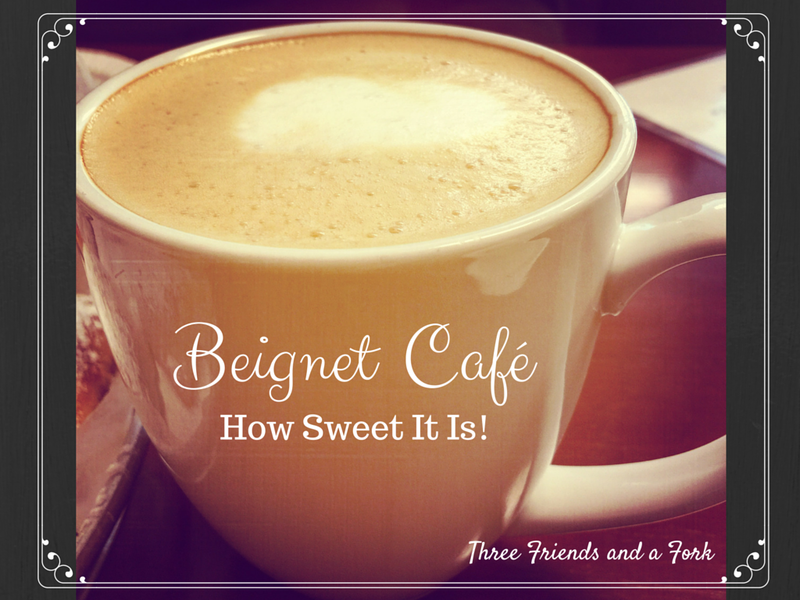 Three Friends and a Fork give Beignet Café a big welcome and 3 Sweet Yums UP!